Who does not like surprises? Anyway, the stage was set and the people lay in wait for LL to appear. 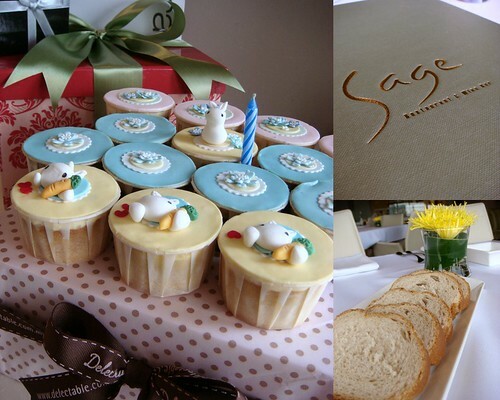 The venue: Sage at the Gardens..
At 1pm sharp LL arrives and we all yell… SURPRISE! Anyway, on to lunch. 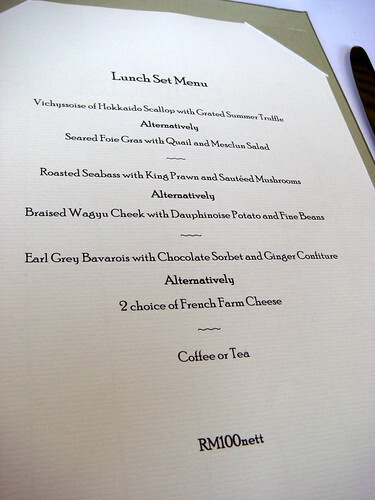 The set menu at Sage is quite a steal as you can see. 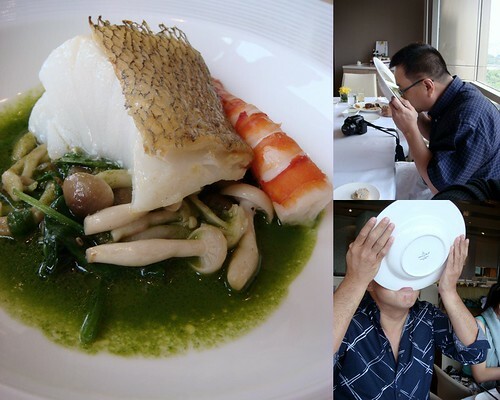 Only RM100 for a 4 course lunch. 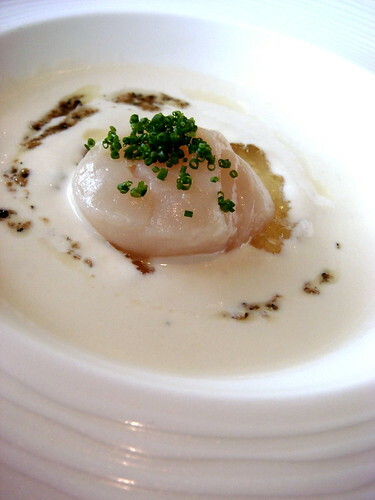 The Vichyssoise of Hokkaido Scallop with Grated Summer Truffle – creamy, smooth and slinks down your throat effortlessly. The scallop was so fresh it was almost still moving, i.e. it was served sashimi style… raw. The truffle flavour infused the entire dish. 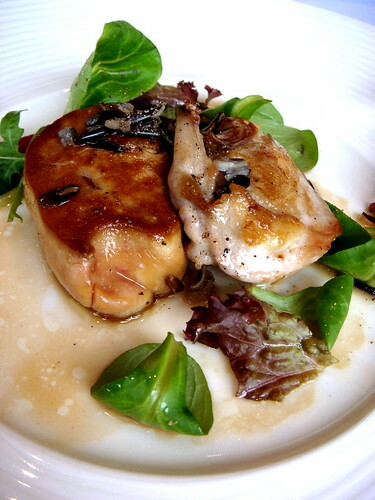 The foie gras (on the left) Quail (on the right) did not disappoint. Rich, gamy with a cutesy tiny quail drumstick to match. The smaller the bird the more tasty the flesh – I totally agree! 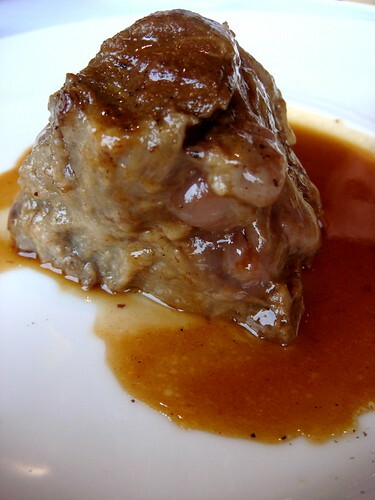 The Braised Wagyu Cheek with Dauphinoise Potato and Fine Beans – Incredibly melt-away in texture with a strong gamy taste that only some people enjoy.. and believe me, I enjoy! 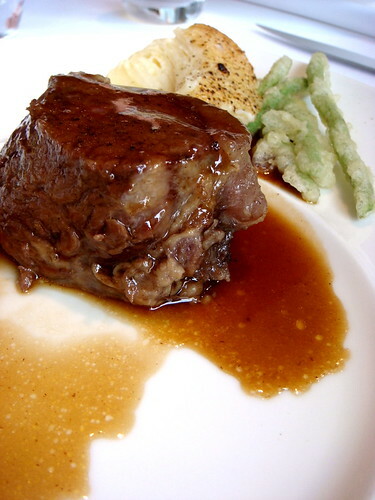 The first photo was a picture of the Wagyu on LL’s plate. This photo is a picture of my own Wagyu. I think it really looks like the Matterhorn, right? 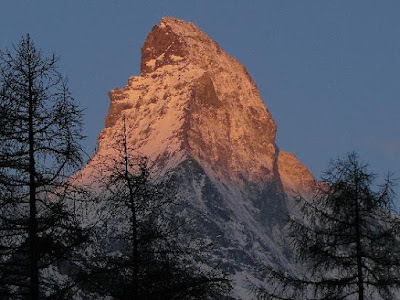 The Matterhorn – Swiss Alps. No wonder bakers have such huge muscle… from lifting plates! This is fbb and Nigel of Just Heavenly, drinking up whatever sauce remains at the bottom of the plate. The Roasted Seabass with Prawn in Mushroom sauce was excellent to say the least. 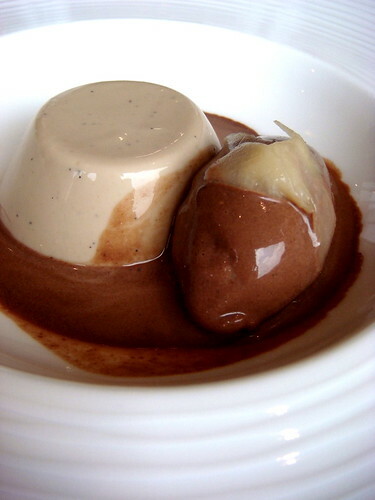 For dessert, the Earl Gray Bavarois with Chocolate Sorbet and Ginger Confiture. Another fantastic concoction – smooth, creamy, gelatin texture with a strong Earl Gray flavour this was really a great dessert. 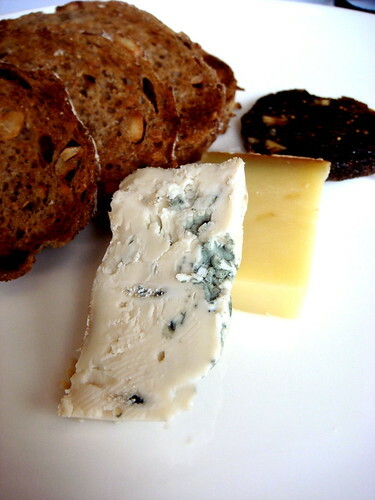 French Farm Cheese – A rather small portion but if you had the earlier dishes, this would have just been a good size for dessert. Time for cake! 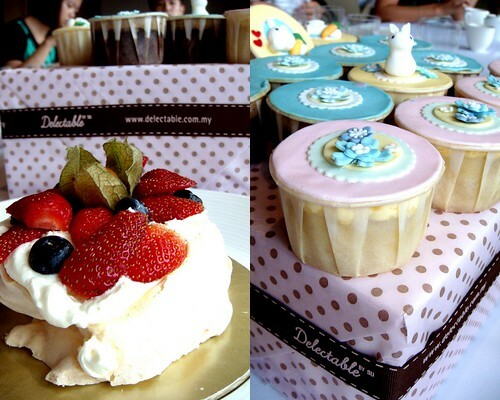 This cute little pavlova courtesy of FBB, made just of LL, with much love. 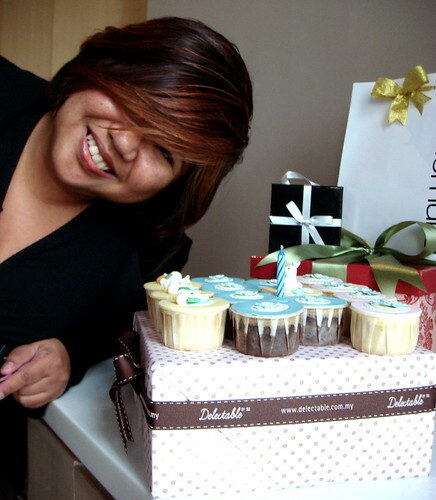 Also, cupcakes from Su of Delectable to complete the birthday celebration! Pressie opening time, so say Cheese! Awww.. you're all are so sweet (re. all the surprise parties…). Ooo….let me hop over to LL's blog to give her a wish. Food looks really yummy! the surprise that almost didn't happen! I'm salivating looking at the piccies. Good food and company for LL. Many happy returns to LL. Thanks, guys. 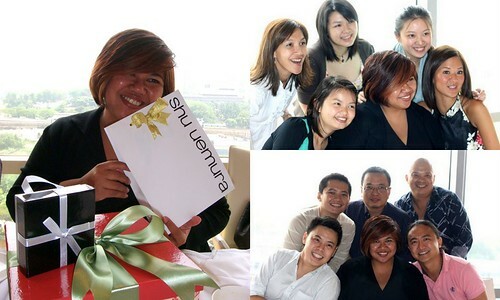 I LOVED the surprise! (Or almost-not-a-surprise party!). Mmmmuaksss!!! Great food, great companies.. heaps of funs!!! Great party there – food & company! Ai Yer… So many people one er… Ha Ha. Glad you had a lovely time. And Yappy Birsday to LL too.